Here's another really easy dish for company or just for a delicious weeknight dinner. 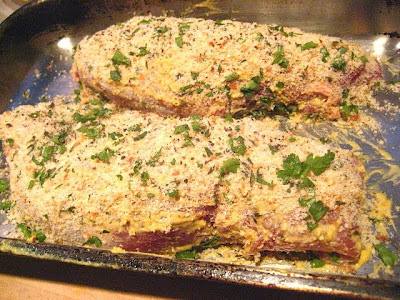 You can coat the pork in the morning with the mustard, herbs and breadcrumbs and keep refrigerated until ready to roast. (This makes yummy leftovers, so make 2 pork tenderloins instead of 1 and double the recipe). Make your breadcrumbs. Pulse the bread in a food processor or mini chopper and transfer to a bowl. Add the chopped herbs and grated cheese. Season w/ salt & pepper. Set aside. In a shallow dish, combine the mustard, garlic and fennel seeds. Season the pork tenderloin with kosher salt & pepper. Roll the pork in the mustard mixture and make sure you get it on all sides (I use my hands). 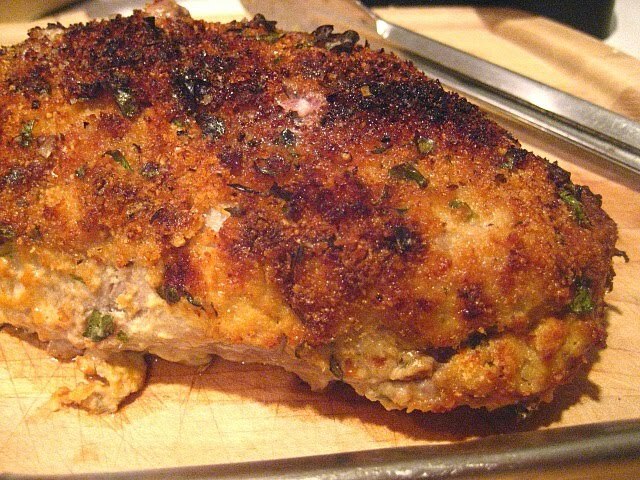 Spoon the breadcrumbs all over the pork, patting the crumbs into the mustard with your hands. 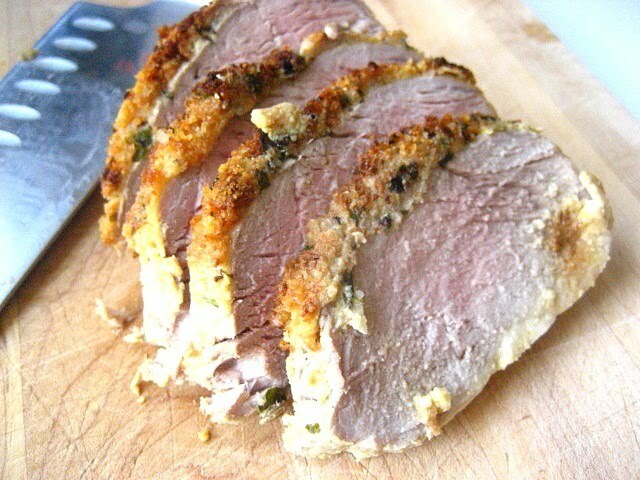 Lay tenderloin(s) in a roasting pan coated w/ cooking spray and drizzle the top with olive oil. Roast at 450F for about 40-45 minutes, until pork registers 150F with a meat thermometer. Pork should be cooked to 160F, but I like to take it out at 150F and let it rest, so it doesn't dry out. 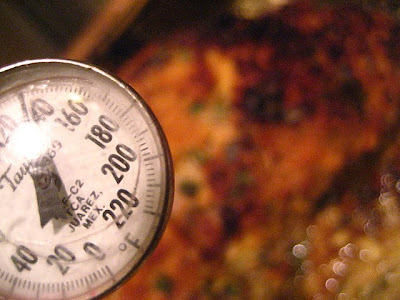 It is important to let the pork rest for at least 10 minutes before slicing, so the juices redistribute and the temperature rises. Serve with those yummy smashed potatoes & olives from yesterday's post. I haven't eaten anything yet and now my stomach is growling! I just got on the computer this morning and my taste buds are waking upn looking at this, and yes I want those potatoes too! Mmmm...I love pork tenderloin! The coating sounds wonderful. Good thing I happen to have a tenderloin in the freezer. Stacey - I just made pork tenderloin Monday night and slathered on mustard and herbs like you - BUT why oh why didn't I put this crunchy crust over it? Next time, I'll know better. If there's one thing I love with pork, it's mustard, so this recipe DEFINITELY appeals to me! It's a good think I've got a nice piece of pork in the freezer! This looks awesome. 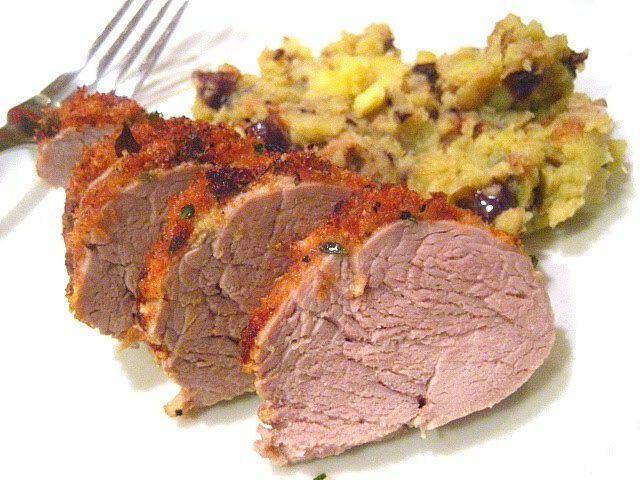 We eat pork tenderloin a lot here...I love how versatile it is. Looks so good! I had the best pork tenderloin Sunday night but I have yet to try and roast one at home. Wow, Stacey! I made this last night. Fantastic!! I didn't use a tenderloin because I had a center cut roast defrosted and it was great. So flavorful and was really super easy!!! Thanks!!! Looks yummy! Ina Garten takes her pork out oven at a much lower temp (138, I think) and then lets it rest covered. Have you ever tried that? What do you think? I've taken mine out at 142 and let it rest and it's been very good. I take mine out at about 145F and let it rest, and it always juicy and delicious! i bet it makes great leftovers - a pork sandwich with a smackerel of the drippings/gravy...? salivating like crazy. lovely temperature you got on the pork, by the way. absolutely perfect! yum--I'm picking up a pork tenderloin tomorrow. Thanks! That brown crustiness on the pork tenderloin looks so good! I have to make this. I made this last night-had a problem with the breadcrumbs browning too quickly-maybe I needed more oil-put foil on it. Family loved it reminded us of the English Muffin chicken-thanks. Cooked this receipt AGAIN last night. It had been quite a while. As always, DELICIOUS! Love all your receipts!